Alghero is one of the most beautiful pearls in Sardinia. A small town in the province of Sassari counting about 44,000 inhabitants. Every year is visited by tens of thousands of people who appreciate the wonders of the sea, its amazing beaches and a distinctive culture, unique in the region. In recent years, thanks to the landing in the local airport of the low cost airline Ryanair, the number of tourists is further increased, so as to make the Sardinian town a vibrant and cosmopolitan place. Moreover, Alghero has been chosen as the headquarter of the WRC Rally Sardinia for three years in a row making it the perfect location for the event. 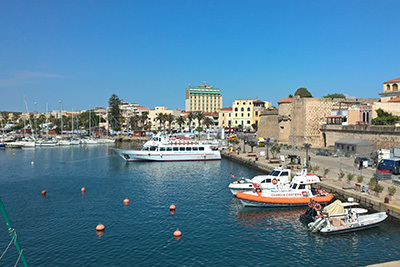 Alghero is universally known as the Catalan city in Italy, for being a Coral Riviera and, as affectionately called by the Catalans, the "Barcelonetta". It was founded in 1102 by the Doria family, the most powerful one in Genoa. They decided to fortify a hill in the Sardinian land, bound by a wide isthmus with the mainland on which the algae piled up (perhaps that is the reason why it was given this name). "Aleguerium" was, in fact, also in the past, its name and the most likely hypothesis is that the name came from the stagnation of algae on the coast. Long before the Christian era, the Phoenicians established a trading post in this bay exposed to the winds of western Sardinia. Here in the early Middle Ages the Arabs set up a strategic base from which they undertook raids on the southern coast of France. The ancient Romans left more than one track like a Roman villa, a sanctuary, a necropolis recently discovered. They arrived in Sardinia around 260 BC after having conquered Carthage in the Punic War and settled along the north coast in Porto Conte. At the beginning of the twelfth century the Genoese settlers fortified the small peninsula still nestled in its historic centre. Finding your way in the city is easy. There is a very compact city centre (city map), divided into three main groups: one that focuses on the Civic Square and Castellas, another one between the Cathedral of Santa Maria and Via Carlo Alberto and Via Cavour, and the oldest one, between the Via Gilbert Ferret and Via Roma. 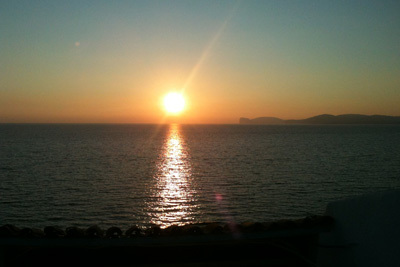 What to see in Alghero? 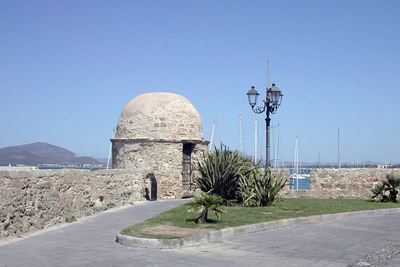 Going from the ancient city walls towards the sea, you meet the towers and bastions. The massive rocky promontory of Capo Caccia is on the horizon and its view of such beauty will leave you speechless. By ferry you can get to Capo Caccia in 30 minutes and visit the famous Neptune's grotto, about 4 km long. Remember that you can visit all these astonishing places by renting a car at the Alghero airport. The sunset is unique in Alghero and the evening stroll along the seafront is a very popular tradition with local people and tourists. Bars and restaurants along the way add a touch of charm to the atmosphere. Festivities and seasonal events in Alghero fill with passion and enthusiasm the visitors, attracted by important religious and culinary festivals like the Setmana Santa (The Holy Week in Alghero), Bogamarì (sea urchin) festival and the Feast of San Giovanni. Worth a visit are the archaeological sites of the Nuragic Palmavera, the ancient Roman port of Portus Ninpharum and not so distant, the magnificent Basilica of the Holy Trinity in Saccargia. Not to miss the medieval villages of Bosa and Castersardo.